Three main medicines were found to be useful for treatment of brood diseases in Apis cerana in Jumla. EFB responded to all three treatments and TSBV to the herbal treatments only. i. 'Terramycin' (oxytetracycline) antibiotic powder (as recommended by Morse and Nowogrodzki 1990, Akratanakul 1987, etc.) mixed into sugar syrup in dosages of 60-65 mg per colony and fed on alternate days for a total of three times. ii. Azadirachta indica (neem) oil mixed in sugar syrup at dosage of 2-3 drops per colony depending of the size of the colony. This is fed at least three times per colony on alternate days but may need to be fed for up to seven doses in total, depending on the severity of the infection. 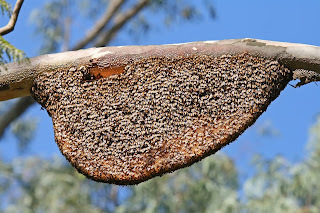 Care must be taken with dosages as high concentrations of neem oil will kill the bees feeding on the syrup. These should be boiled together for 5-10 minutes and the resulting decoction used to make sugar syrup for feeding colonies. If herbs were dried, less could be used but in the same proportions. Local varieties of all the plants except Melia and C. longa are found in Jumla and turmeric is used in cooking in every household. One local beekeeper tried Swertia chirata and / or Swertia recemosa (locally called Chiraiti or Pate Tito and Danthe Tito respectively) in place of Melia with positive results. Artemisia can be used instead rather than in addition to Melia also.